The second half of the ninth season of The Walking Dead will return next February. After the mid-season finale introduced the season’s newest and most disturbing villains, The Whisperers, the show will go on hiatus until 2019. Michonne and the others have finally clashed against a group of humans who choose to dress themselves as walkers and who are determined to destroy everyone in their path. Samantha Morton has been cast as the leader of the Whisperers but we have yet to meet her character on the show. The newest trailer gives us a sense of the dangers that are approaching. The latest episode also saw Negan being inadvertently (or intentionally?) freed from his prison of the last years. While everyone is too distracted to notice he’s gone, the trailer reveals that he is making a comeback. There’s also whatever fallout happened between Alexandria and the other communities. 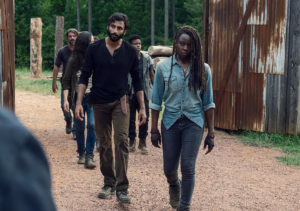 Siddiq asks Michonne what happens if the Kingdom falls but Alexandria survives and the latter coldly replies, “Alexandria survives.” Hopefully, we get to see flashbacks about what happened in the last six years. Watch out for The Whisperers when The Walking Dead returns on February 10 on AMC.